You can read a copy of the letter here: Letter to Secretary of State for Health (8 April 2016). And you can read the sample of comments from supporters here: Sample of Comments from Campaign Supporters. Pharmaceutical companies are being allowed to make obscene levels of profit from life-saving drugs, resulting in escalating costs for the NHS and pricing a growing number of drugs out of reach of patients. And, to add insult to injury, the British public has contributed to the cost of developing many of these drugs through donations to cancer research charities. When the British public pay towards the cost of research that results in a safe and effective drug, an unreasonably high price should not limit their access to it – a drug that nobody can access is 100% ineffective and drug patent owners should not be allowed to retain exclusivity on drug discoveries if they limit access to the drugs through aggressive pricing. Furthermore, many opportunities for potential new treatments are being missed because the system is overly dependent on the private sector and failing to attract investment in discoveries that have limited commercial potential, even if they have demonstrated therapeutic potential in laboratory studies. And sadly, although it was set up with compassionate intentions, the Cancer Drug Fund is bound to be fuelling price escalation by raising the amount we are prepared to pay, so this is not a long term solution. 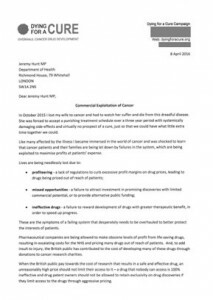 It is sickening that these organisations are being allowed to commercially exploit the desperation of cancer patients and the hopes, generosity and compassion of millions of people who give money to cancer research to help develop these drugs, effectively condemning patients to premature deaths and holding back cures for this devastating disease. This is an industry that is out of control and intent on achieving its ambitious objectives at any cost. Over 1200 people have now signed our petition calling on the UK Government to take action to address this scandalous situation. Please help keep the momentum going by encouraging other people to sign and share the petition. On our own we can be ignored but together we can bring about change. If you haven’t yet signed the petition, please click the following button to sign it now (it only takes a few seconds). No Replies to "Campaign Letter to Health Secretary"